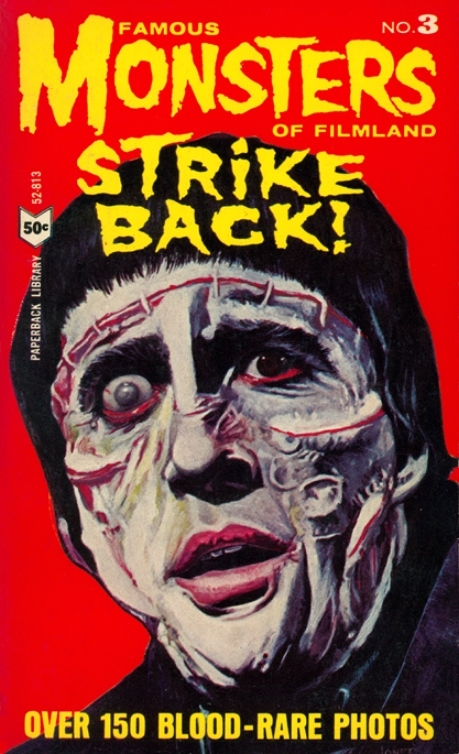 Frankensteinia: The Frankenstein Blog: The Covers of Frankenstein : Famous Monsters Strike Back! The Covers of Frankenstein : Famous Monsters Strike Back! Christopher Lee’s pie-in-the-face Frankenstein Monster never looked so good as in this painting by Russ Jones. Famous Monsters Strike Back!, published by Paperback Library in 1965, was the third and last paperback reprint package of articles and photos from Famous Monsters of Filmland magazine. 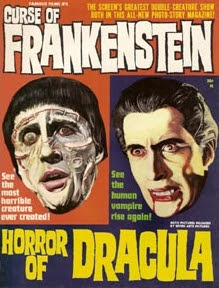 The strong art was originally half of a dramatic double portrait by Jones of Chris Lee in his star-making roles as Frankenstein’s Monster and Dracula on the cover of 1964's Famous Films No.2. Art directed by Jones with Joe Orlando, and published by Jim Warren, the magazine was an experiment in using stills from films in a comic book-like “photo-story” format. The paperback version of the art comes off best, uncropped, with sharper reproduction and more vibrant colors. The Canadian-born Jones was a multi-tasking artist who wrote and drew comics for all the major publishers. 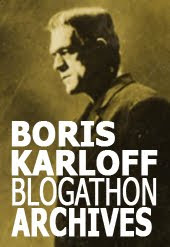 In 1964, he was the founding editor of Warren’s Creepy, even designing the title’s distinctive host character. 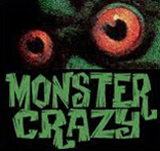 In 1966, Jones edited the short-lived but handsomely done Monster Mania for Renaissance Productions. The magazine is memorable for its extensive coverage of Hammer Films, a welcome change to the largely Universal-centric coverage of Famous Monsters and many of its imitators. In the late 60s, Jones traveled to England and worked as a storyboard artist for Hammer. Warren magazine cover gallery. Here’s another one.